Anne Marie and Rob are going to be married on May 23rd. 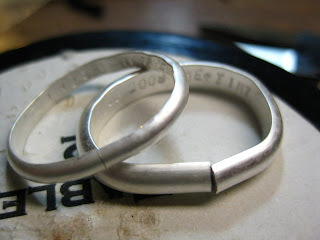 They commissioned me to make their wedding bands (an honor that I will not soon forget) and I decided to take some pictures of the process. 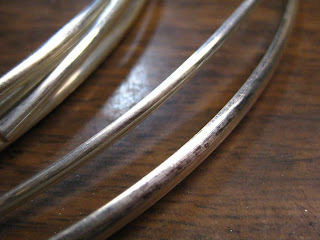 I started out with half round wire for the rings, 6ga for Robs, and 10ga for Anne Marie's. 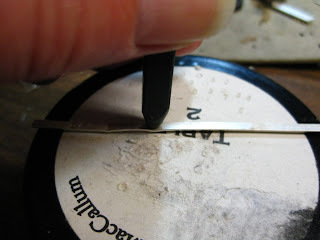 I cut a length that gives me a little play room in case I mess up with the stamping...which did happen on Anne Marie's (10ga is tiny to stamp on, especially wobbly half round wire). For stamping and general manipulation of the metal, it needed to be annealed first. 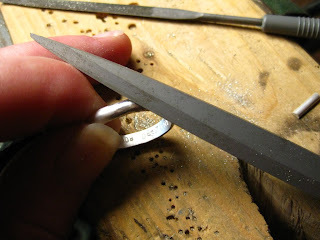 This process makes the silver molecules loose so that they will take a stamping much easier than if this step is skipped. 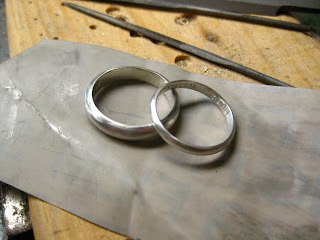 I actually had to anneal these rings many more times throughout the process. I stamped on a hockey puck (from my nephews bar mitzvah...don't tell him!) so I didn't mar the outside of the wire too much. The wire gets a little funky when you stamp it. This looks awful, but no worries, it all works out in the end. 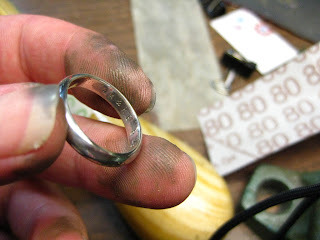 After I got the insides of the rings stamped with the inscriptions, I use my ring mandrel to eyeball the length of wire I need for the size of ring I want, and saw it away. 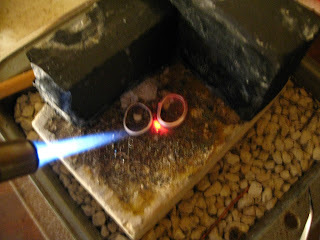 Then I formed the bands around the mandrel to get them sort of roundish so that I can solder them closed. After the soldering, there are some solder spots/pools left on the metal, I have to file that off, inside and out. 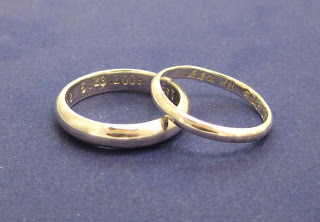 I also filed into the edges on the inside, making the rings very smooth, and comfortable for always and forever wear. 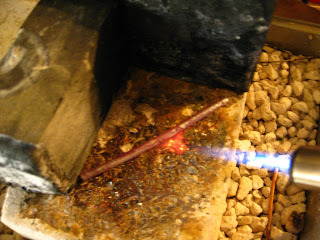 Here is my fancy ring mandrel, isn't she pretty? 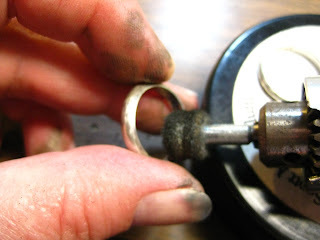 I use a rawhide hammer to make the ring a circle and then to size the ring, hammering the ring down, turning the mandrel all the time until it is at the correct size I desire. Now it's time to sand, sand, sand...and then polish. 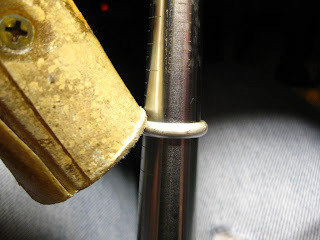 My mandrel has sizing grooves that leave little marks on the inside of the rings, not to mention all the other accidental tool marks from the forming. 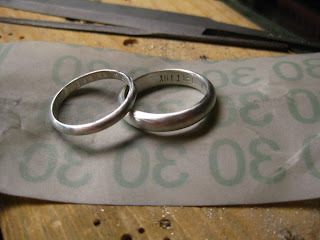 I start with #80 sanding paper, and work my way down to #30 finishing paper. In sandpaper terms, that might be 320 grit to 600 grit. It's a lot of work sanding the inside and outside by hand, but the results are wonderful. When the finish is desired, it's time to polish. 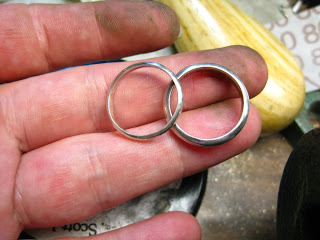 I am using tripoli to polish these rings to a mirror shine, inside and out. Here they are finished. These were really fun to make, I hope to be asked again! Wow Nancy, that's quite a process. They look beautiful! wow very cool! 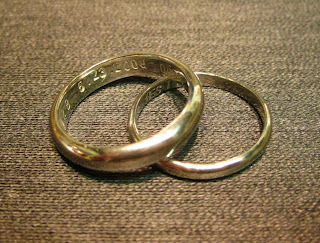 do you make wedding bands in only silver? or other metals too? Fabulous Nancy! They came out perfect you're so talented. Their mouths are going to drop. These are wonderful. What is the inscription? Jen, I would make them in gold as well. They're lovely. Congrats on such a special commission!